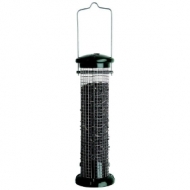 Your backyard birds may not love coffee as much as you do, but they’re sure to love eating delicious black oil sunflower seed from the NO/NO® Coffee Pot Mesh Bird Feeder! 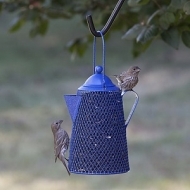 This cute coffee pot shaped bird feeder dispenses seed from the entire surface area through unique diamond mesh holes. These holes are small enough to hold the seed securely in place, but large enough that clinging birds can pull individual seeds through to eat. The blue powder-coated design will resist rust and be a standout addition to your yard. This feeder can hold up to 2 lb of sunflower seed to attract and feed lots of bird visitors! The all-metal construction resists damage, so you can enjoy this bird feeder for years to come.